Serving small business, enterprise, and non-profit for over a decade. Quite a few individuals, too. 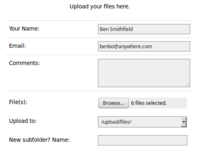 FileChucker is the perfect tool for anyone who needs to accept data or files from their clients.